The president of a police union was cleared of all wrongdoing in the shooting that killed an unarmed16-year-old girl and her unborn child after his union donated to the campaign of the district attorney in his case. 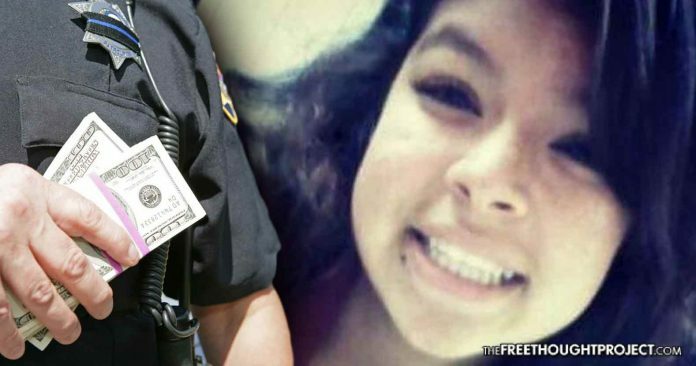 Alameda County, California – When the president of a police union shot and killed an unarmed 16-year-old girl and her unborn child, there were a number of things he did wrong leading up to her death, which included failing to turn on his Body Camera. But the one thing he did right in the eyes of law enforcement was to donate a significant amount of money to an influential campaign fund. Sgt. Jeremy Miskella, president of the Fremont police union, donated $10,000 to the campaign of Alameda County District Attorney Nancy O’Malley in November, and she returned the favor by clearing him of all wrongdoing in the fatal shooting of Elena Mondragon, according to a report from the East Bay Express. Mondragon was shot and killed by Miskella and Fremont Detective Joel Hernandez in March 2017 while she was sitting in the passenger seat of a car with her cousin and two of their friends. The officers had been stalking the group, claiming that one of its members, Rico Tiger, was a suspect in multiple armed robberies. Tiger later said that because the officers were dressed in plainclothes and driving an unmarked car, the group did not realize they were police and they began to increase their speed when they saw that the officers were following them because they thought they were being robbed. Miskella and Hernandez responded by opening fire and unloading their AR-15 rifles on the car. Instead of hitting their target, which was Tiger, they killed Mondragon and her unborn child. Tiger was then charged with Mondragon’s murder, and it now appears as though he will be the one who faces the punishment for the officers’ reckless actions. In addition to conducting surveillance on the group and failing to turn on their Body Cameras even though they were planning to confront Tiger, Miskella and Hernandez were also aware that they were following a car filled with teenagers, and when they opened fire on the vehicle, they did so with the knowledge that one of the innocent teenagers would be shot. In response to accusations that a campaign donation from the Fremont Police union made her decide to clear its president of all wrongdoing in the shooting, O’Malley told the East Bay Express that her decision was unbiased and that the officers had not broken the law. While O’Malley apparently sees nothing wrong with accepting donations from the officers she is investigating, her opponent in the race for district attorney, Pamela Price, argued that there was a serious conflict of interest. Mondragon’s family has now filed a lawsuit against the city of Fremont and its police department. In a statement reported by NBC Bay Area, John Burris, an attorney for the family, criticized the fatal decisions made by the officers. “Shockingly, officers engaged in a series of egregious tactical errors and contravened their training and basic common sense, which resulted in an outrageous loss of innocent life,” Burris said. Miskella and Hernandez have returned to their jobs, O’Malley now has an additional $10,000 in her campaign fund, and it appears that the only people paying for the reckless actions of the officers and the failure of the justice system are the teenager who is facing time in prison for a murder he did not commit and a family that is grieving the loss of Elena Mondragon and her unborn child.